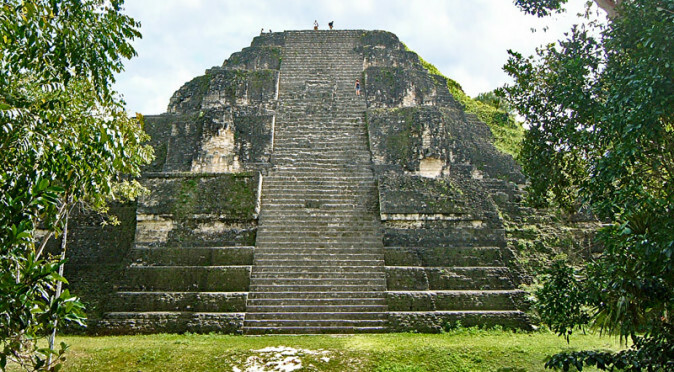 Fig W0856: North Acropolis with the remains of Templo 33 centre shotHistoria (IDAEH) approved its destruction and one of the fundamental temple of the Great Plaza and Northern Acropolis was removed from the landscape. 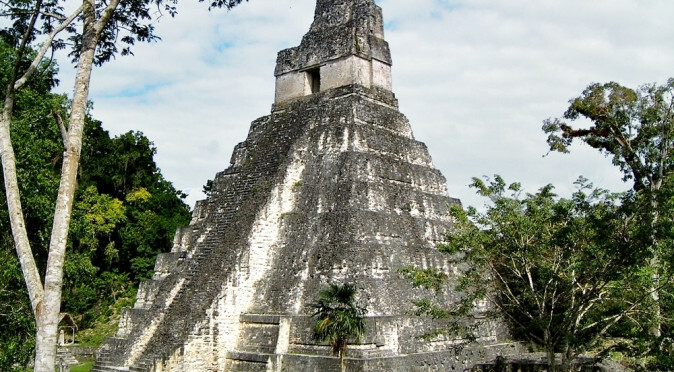 The decision was certainly swayed by the costs, but it is also possible that the desire to open Tikal as a tourist destination meant they had to produce a hasty and drastic solution, in order to make the site safe. 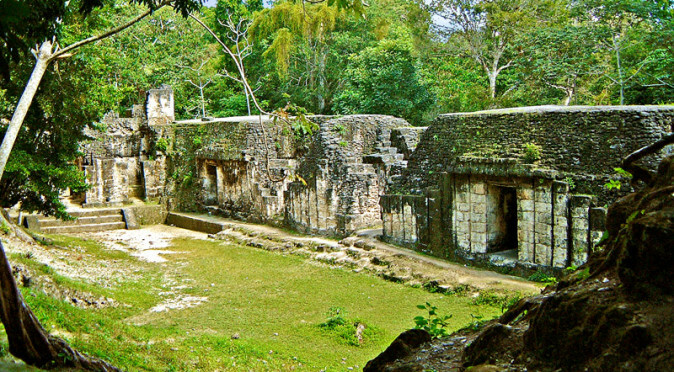 Templo 5D-33 once rose, coincidently, 33 metres and stood prominently amongst the four temples which line the southern side of the North Acropolis on the north side of the Main Plaza. 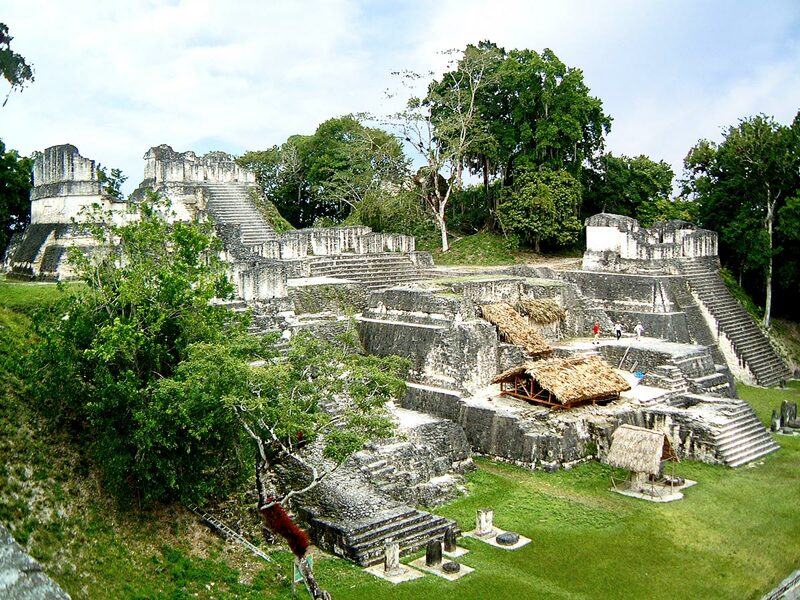 The Northern Acropolis was the epicentre of Tikal, with eight temples packed into two sets; four circling a small plaza on a raised platform and four which are in a line on the south side of the platform. Sadly, Templo 33 is the stunted pile of rubble covered in wicker huts that you can see in the centre of fig. W0856. Fortunately, the deconstruction did reveal a hidden history that may otherwise have laid buried and undiscovered. 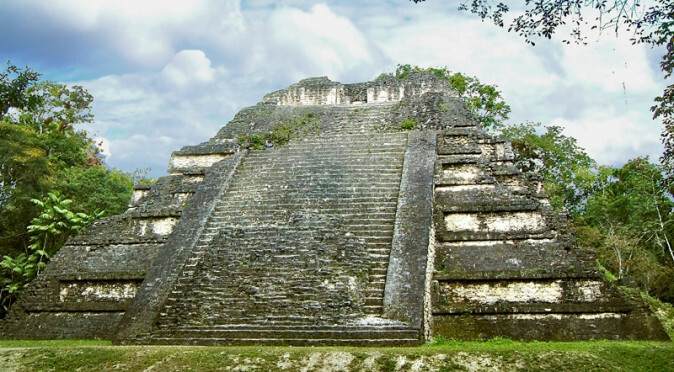 In all, three phases were uncovered, the first of which was built as a mausoleum for Siyaj Chan K’awiil II, who reigned from around 425AD and whose remains were found beneath a stela bearing his name (stela 31). The stela was a later addition, in the second phase, which it is now thought was undertaken as part of a ritualistic remembrance service, considered to be the equivalent of the modern “Day of the Dead”. 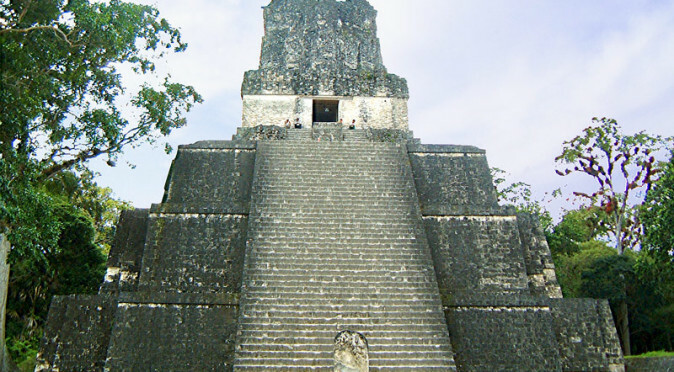 Many of the temples at Tikal have been modified in similarly small periods of time after they were erected – presumed to be either 20 or 52 years, in keeping with the Mayan calenders. 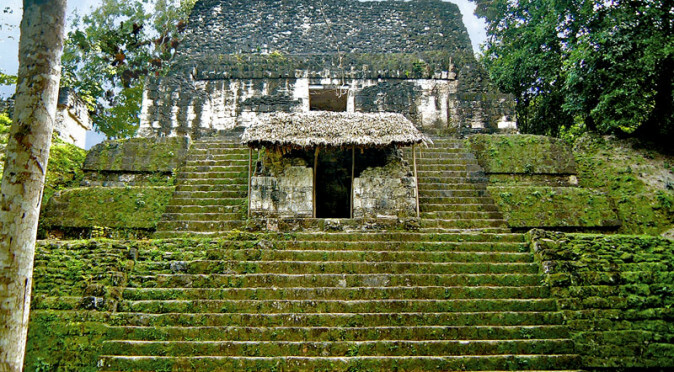 During the ceremony, the bones of the deceased would be removed from the grave, cleaned, and then placed carefully back again and the temple rebuilt. 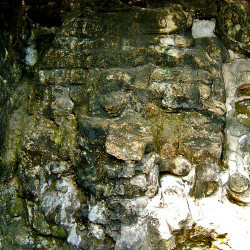 In both the first and the second phases of the temple’s history, it featured a huge stucco masks which flanked the staircase on the southern face, and it is these masks that lie protected underneath the wicker huts that are visible in W0856. The first phase featured a mask of monster with snakes flowing from its mouth which has been dubbed “Snake Mountain” – unfortunately, this mask is barely legible now as you can see in fig . W0847. 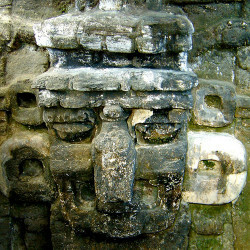 The mask from the second phase is far better preserved and is clearly of Chaac, the God of Rain, although in a style more familiar to the Teotihuacan rain God, Tlaloc, or Zapotec version, Cociyo. The third phase of Templo 33, known as 33-1, took place some time between 562 and 692 and was again centred around the burial of Siyaj Chan K’awiil II. The ceremony included fire, the breaking of pottery, moving the funerary stela up to the second tier and rebuilding the Temple structure. 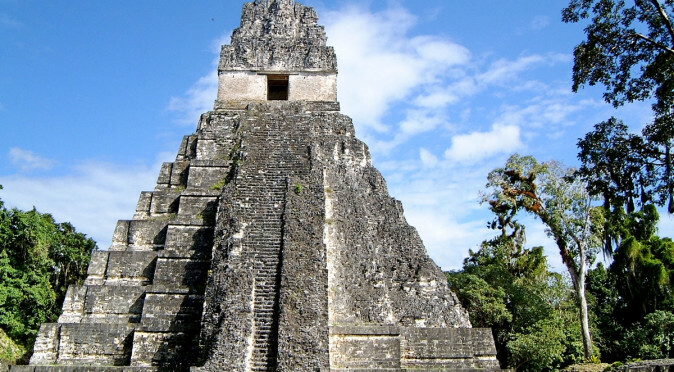 They also added a second burial to the upper section of the new temple, but because the third phase took place in a period of literary dysfunction known as the Tikal Hiatus, the burial is unmarked and the interred unknown. 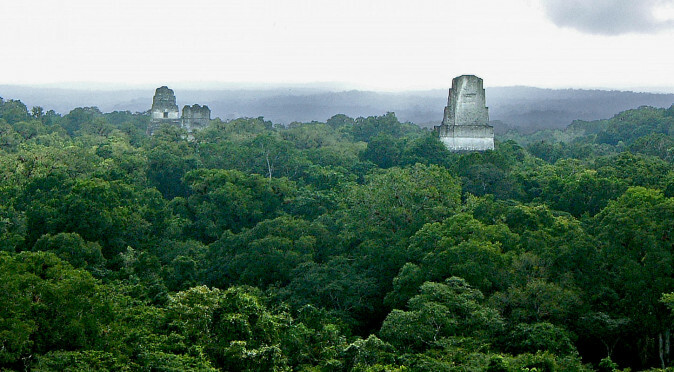 The Tikal Hiatus began with the city falling to long-term enemy Calakmul in 562AD and resulted in no stela or inscriptions being added anywhere in the city. 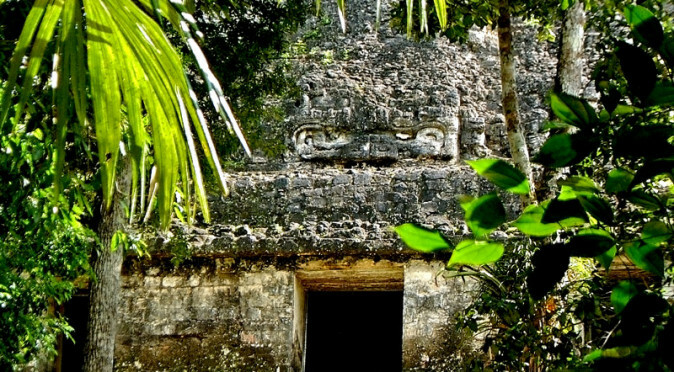 It is curious that the original burial was honoured and not torn from the temple, and this may reflect on the power that they believed the ancestors wielded. 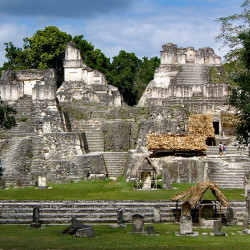 It is possible that the fire ceremony was performed as an act of cleansing, though, before the new burial could be added.